Brad Pitt has redefined himself and the medium he makes his living in several times. The variety of projects he's taken on in the past decade has been a rewarding mix of big budget blockbusters, family friendly fare, and slow burning dramas. Perhaps his most memorable role in that time span, however, is that of Lt. Aldo Raine from Quentin Tarantino's Inglourious Basterds. His knack for physicality and comedic timing made his lead role in the otherwise-awesome ensemble stand out that much more. 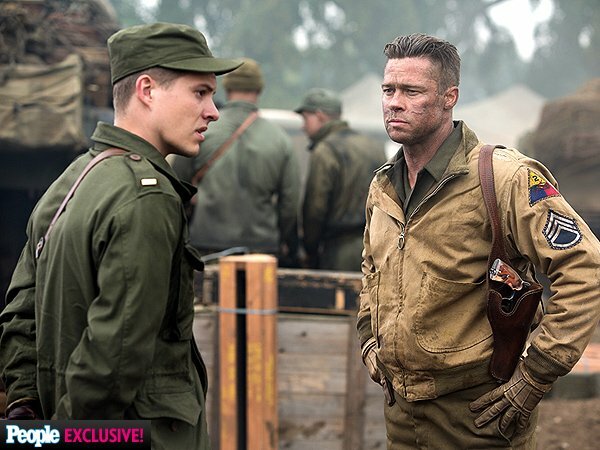 World War II action really suited the classically handsome Pitt then, and judging by the new photos from his latest film, Fury, it looks like it still very much suits him now. As you may remember, we previously showed you the first image of the cast mounted on their noble steed of steel, and now People Magazine has some exclusive photos and an interview with director David Ayer that tease us with more details about the project. "...playing this badass, hard, tough, intense guy. It's a different kind of role for him." "He's insanely good in this thing. He's a joy to work with and I can't wait to work with him again." Could he be on the verge of a career resurgence, much like Joaquin Phoenix before him? I certainly hope so, because before he started getting weird on the world, I really liked LaBeouf in certain roles outside of his Transformers work. He's shown in the past that he has more than a glimmer of talent, and if he can get himself to focus up and ditch the paper baggage we might see him reach Pitt's level someday. The most exciting quote in the entire interview, at least in my extremely enthusiastic mind, is how Ayer says he's attempting to make "the ultimate tank movie." Now the tank movie genre isn't as big or varied as your standard World War II film, so there's still a lot of room to work with. In fact, the only film I can think of that would compare with this one is the 1970 film Kelly's Heroes. Kelly's Heroes is admittedly more of a wartime heist comedy, but think about what it would be like if you took what that film did with a tank and replaced the motive with pure destruction against the Nazis. I'm not going to say this would be like Inglorious Basterds on a tank, but if David Ayer knows anything it's balancing small, character driven laughs as punctuation to bigger, more action driven set pieces. With the diversely awesome cast at play, and Brad Pitt at the center, this is shaping up to be a movie to look forward to. Fury rolls into theaters on November 14th, 2014.